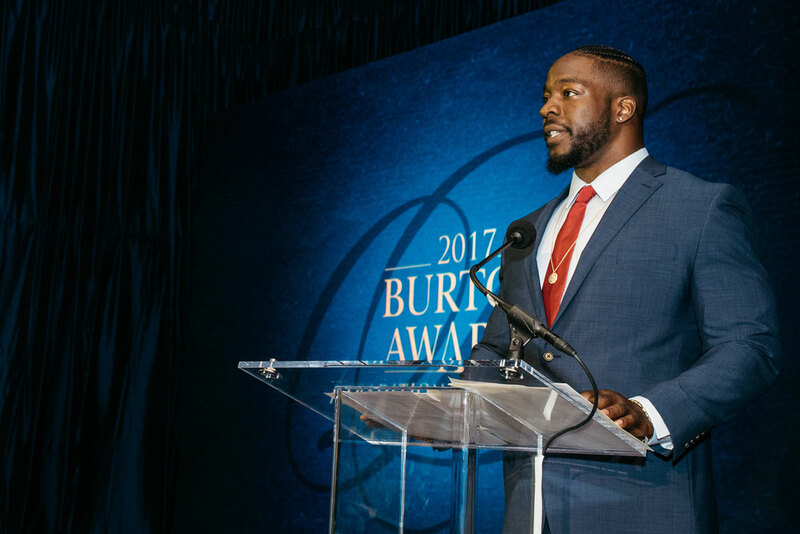 A chance meeting on an airplane with one of the nation’s most prominent lawyers recently led to a once-in-a-lifetime opportunity for Lamarr Houston. On a flight with New York-based attorney William C. Burton, the Bears outside linebacker mentioned that he hopes to attend law school after his playing career ends. Burton, the founder and chairman of a national awards program that was established in 1999 to reward great achievements in law, invited Houston to speak at the prestigious 18th annual Burton Awards May 22 at the Library of Congress in Washington. The Burton Awards honor everything from legal writing to publications to the greatest reforms in law. The main focus is on effective legal writing, rewarding partners in law firms and law school students who use plain, clear and concise language in their writing. “Being around football and being around my parents—who were mom and pop entrepreneurs—there are a lot of things that you can learn in terms of rules and regulations that people miss all the time that are sometimes detriments to their businesses and detriments to their lifestyles,” Houston said. Previous speakers at the Burton Awards have included U.S. Supreme Court Justices Stephen Breyer, Sonia Sotomayor, Ruth Bader Ginsburg, Antonin Scalia and John Paul Stevens. Dignitaries who attend typically include partners of the largest law firms in America, law school deans and professors from across the nation. While playing outside linebacker in the NFL seems to require an entirely different skill set than being a lawyer, Houston sees similarities between the two vocations.